In their recent commentary published in the South African Journal of Science, Taru and colleagues1 highlighted the possible shortcomings of the approved management plan2 of Golden Gate Highlands National Park (GGHNP). Although they can be commended for their critical efforts to evaluate policies within an adaptive management framework, many of their concerns were grounded on fragile factual foundations. Consequently, despite their good intentions, their specific recommendations seem to be misconstrued. It is not necessarily our aim to defend the management plan of GGHNP, nor do we believe that it is faultless. Instead, in this brief essay, we will firstly highlight some of the factual inaccuracies in the evaluation by Taru and colleagues and, secondly, point out some considerations that were not plainly addressed in their original commentary. 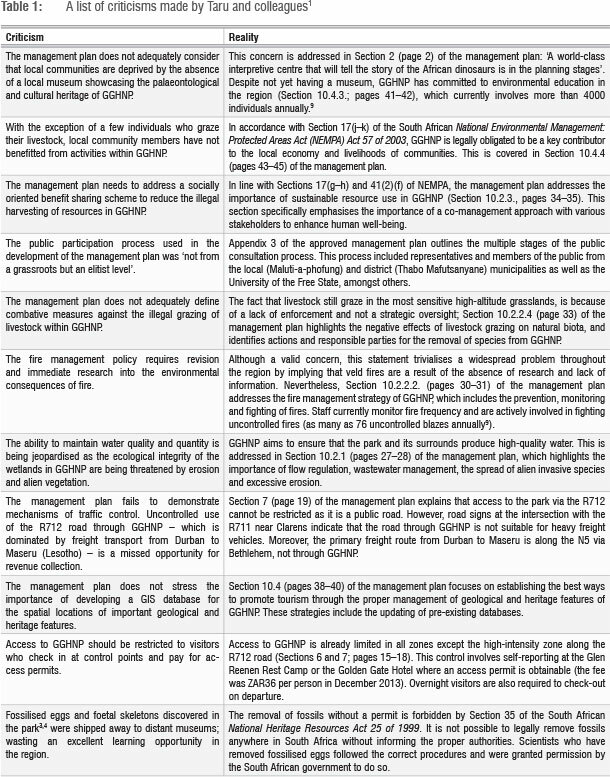 Taru and colleagues pointed out flaws in the approved management plan of GGHNP but, unfortunately, many of their criticisms seem to contradict what is actually written in the document or what is happening on the ground (Table 1). While we acknowledge that they may have been questioning the adequacy of specific sections of the management plan, rather than highlighting their absence, Taru and colleagues did not make it clear where and how their opinions differed from what had already been addressed by the management plan. As such, it was difficult to gain an accurate picture of the reality at GGHNP based on their assessment. In their commentary, Taru and colleagues also called for the accelerated documentation of all the palaeontological3,4, geological5,6 and cultural7 features of GGHNP using geographic information systems (GIS) and suggested that this activity would promote tourism in the region. They went on to imply that the revenue generated by increased tourism could be used to accelerate social and economic development in the poverty-stricken QwaQwa region (Maluti-a-phofung local municipality). This implication is supposedly based on the view that the short-term generation of capital could act as a catalyst for secondary economic growth in the region, which, coincidentally, aligns with the views expressed on page 5 of the approved management plan. Unfortunately, this reasoning is based on incomplete evidence: neither the management plan nor Taru and colleagues' evaluation considered the continuous outflow of tourism-generated revenue from the region. In a preliminary appraisal of tourism in the town of Clarens within the Maluti-a-phofung local municipality, Atkinson8 found that less than 5% of tourism-generated revenue was actually spent within the local municipality, while the greatest proportion of income was spent either in the adjacent Dihlabeng local municipality (37%) or in other cities and provinces (59%). This finding suggests that accelerated tourism will not necessarily alleviate poverty in the QwaQwa region. Moreover, the palaeontological, geological and cultural (i.e. rock art) features in GGHNP all degrade naturally5,6 and increased human exposure will only accelerate this degradation. In this sense, these natural features should be viewed as a finite stock, rather than a sustainable generator of long-term revenue. Given that the revenue created by increased exploitation might just flow out of the region without uplifting local communities, the suggestion by Taru and colleagues is akin to the fable of the farmer who kills the goose that lays the golden eggs: they are potentially sacrificing a small, but steady income for the prospect of a large and immediate pay-off that may never materialise. We would like to thank John Butler-Adam, Earnest Daemane, Stefan Grab, Mohlamatsane Mokhatla, Lisa Mol, Robert Reisz and Philip Taru for their patience, advice and feedback during the preparation of this article.